Each and every SAPICI employee considers as essential values – both at a strategic level and in daily implementation – such elements as the continuous improvement of our products and services quality, the consistency in high standards, the compliance with the most stringent local, national and international rules and regulations, particularly in terms of attention to health and safety and protection of the environment. SAPICI concept of Quality includes providing our customers with products tailored on their needs and requests. Our approach to quality starts from the selection of the best raw materials that we use for the development and production of our wide product range. These are some of the reasons why our customers choose to work with us, and decide to stay loyal to us, our products and our services. In 2003 SAPICI elected to participate in the voluntary program of the chemical industry Responsible Care, sharing the Industry’s commitment for Sustainable Development. 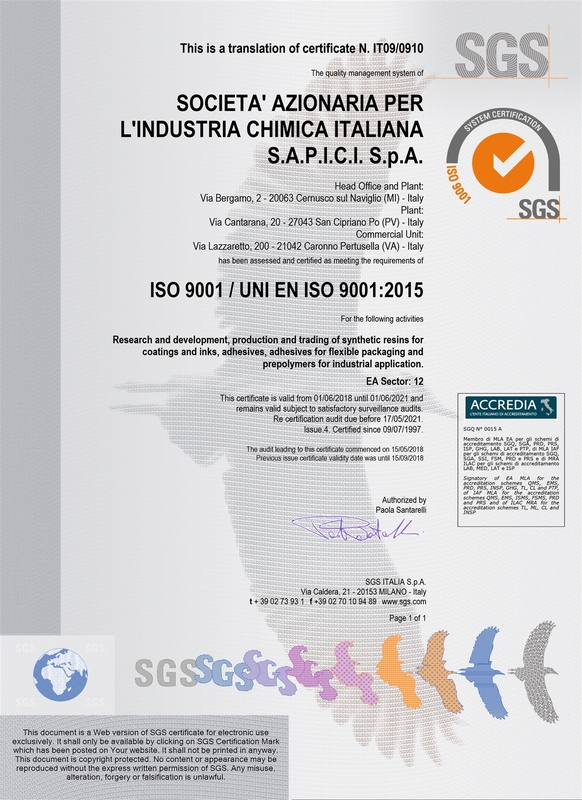 Since 2008 SAPICI China is certified according to the UNI EN ISO 9001. Click to open the Certificate. In 2011 SAPICI won the Product Stewardship Award assigned by the Italian Federchimica Association for the continued commitment and the achieved results in the development of new products, specifically the SAPICI Polurgreen 01, and their responsible management all along the chain. Since 2014 SAPICI China is certified according to the UNI EN ISO 14001:2004. Click to open the Certificate.